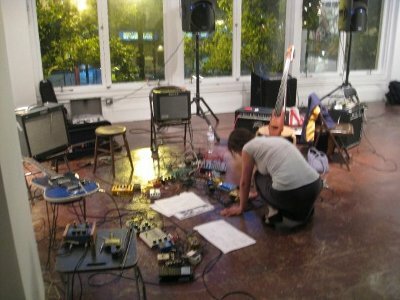 The Outsound New Music Summit continued on Wednesday with a night featuring explorations of electroacoustics and noise. Once again, the two acts were quite contrasting in their interpretations of the night’s theme. The set unfolded as a series of conversations between Sordahl – first on cello alone and then with electronics – and Lopez. The ups and downs in the pitches, rhythms, and intensities seemed to imply spoken language at times. This was especially true during the more staccato and percussive sections at the beginning and end of the set. The long tone sections brought in more of the electronics – Sordahl’s rig featured a Korg MS-20 and iPad. The percussion once again seemed to match the longer tones, with extended rolls, long drum tones, and additional percussion. But there were also moments where the texture diverged, between long electronic tones and rhythmic percussion runs. Even at its most intense, there was a quiet quality to the music that seemed fit with the starkness of their stage presence and the darkened hall. Even at low volume, the moments of silence stood out, with a bit of tension in the air. Space and breath are an important part of how the duo approaches their music, and this comes out strongest in the quietest sections. X A M B U C A is a solo electronic project by Chandra Shukla. We had the opportunity to first see him perform last year with Hans-Joachim Roedellius at The Chapel in San Francisco; we were glad to see him join the lineup for this year’s Summit. On a completely darkened stage, X A M B U C A delivered a set that was simultaneously rich and minimalist. There were segments of long drones cut with high-pitched sweeps, and sections of fast drum-machine runs. The styles of various sections (which segued from one to the next continuously) included fragmented dance-music patterns, elements of rock, and noise. It is, of course, hard for me not to consider electronic music without also considering the instruments used. Shukla’s rig was anchored by an Elektron Analog Keys, along with a Korg Electribe, a Stylophone, and sundry pedals. Looking at these instruments, I can better understand how he was able to move so freely from drum patterns and hits to long tones and dense pads to distortion and noise. It was quite a dynamic performance, showing the more “experimental side” of X A M B U C A compared to what we had experienced previously. It was a solid night, and perhaps the most “out” of the Outsound Summit shows this year, as subsequent nights embraced more idiomatic forms of musical expression. We hope to bring you those reviews over the next few days. We at CatSynth have had quite a few unique musical experiences this season. Today we look back at another of them. In early February, the duo Martha and Monica (Hadley McCarrol on piano and Monica Scott on cello) performed Morton Feldman’s Patterns in a Chromatic Field in its entirety. “In it’s entirety” is no small thing, as the piece consists of a single continuous 90-minute movement. It’s a feat of endurance for both the listeners and performers. But McCarrol and Scott made it seem straightforward and effortless. The performance began with very sparse but unsettled harmonies, with the texture increasing but then returning to sparseness again. It was only the final third that the texture and intensity grew towards a bolder and thicker sound. All the while, the music was constantly changing, repeating a few times, leaving a bit of space, and then going on to something else. This is consistent with Feldman’s interest in sound as something ephemeral and lost, and in creating a sonic space where memory is subverted or “disoriented.” The spaces in between the sounds are important as well, given moments of reflection and mental echoes. All of this might make the piece seem daunting to listen to, especially at the length of a typical feature film. But the combination of space and disorientation were helpful, making it more like thoughts passing in a meditative space. The anxiety in a passage builds, but then dissipates – one acknowledges it and moves on. The passage of time itself became background noise and the sounds became more spatial than temporal. This effect might be more pronounced for someone like myself who sees shapes when listening to music, but I suspect other deep listeners had analogous experiences. Unlike Feldman’s earlier pieces, this one was fully notated using common practice notation. This would both facilitate and make more challenging the process and playing and learning such a piece, where every note makes a difference. It was overall an impressive feat of musical performance, and glad I got to spend an afternoon hearing and seeing it. Another piece from Performa: A Ballad of Accounting 2009: Composition for Cello and Brooklyn Queens Expressway, a composition by Alex Waterman with a 16-millimeter film by Elizabeth Wendelbo. I was quite interested to see this piece, given that it combines experimental music, art and highways, three of our interests here at CatSynth! The video opens along the BQE, along the side, underneath, and riding on the surface, interspersed with images of Waterman carrying or playing his cello near the elevated structures. The music featured long notes set against filtered highway noises. There were lots of drones, often featuring noisy timbres or harmonics, but sometimes more familiar minor tonalities. The visuals included architectural close-ups of the elevated structures – hardly considered among the more picturesque in the city, but still quite interesting. I noticed exit signs for Metropolitan Avenue appearing a few times. One moment that particularly got my attention was a forlorn drainpipe. One could imagine the metallic resonances here, and indeed the sound became more electronic, reminding me a bit of early Xenakis. I also heard sounds that reminded me of more modern granular synthesis. There were also sharp departures from the drones, with very pointed “crackling sounds”, appropriate as the video began to feature rain and water dripping from the pipe. There is a permanent installation of the piece near Calistoga, CA. I am curious to see it sometime after I return home. 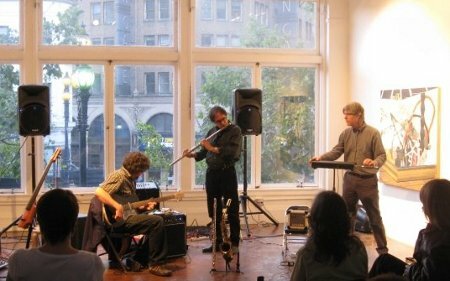 The past Thursday was the latest in the Full Moon Concert Series at the Luggage Store Gallery, curated by Polly Moller. This month’s theme was Blessing Moon. The first set was by a new all-improv trio Free Rein. The group focuses on “Earth music for space people” and includes reeds/flutes, Danelectro 6 string bass, percussion,voice, cymbal, keyboard and theremin. From the program notes, “Valka’s Blessing Moon rituals are inspired by ripe dreams and the balance between dark and light.” This includes drones, effects, lots of long tones and big masses of sound, with a mixture of harmonicity and noise. I did focus on slow bends and other gradual changes of tone through the performance. The first piece did end on a dramatic note, with a rather loud insect-like sound that seemed to have taken the musicians by surprise.